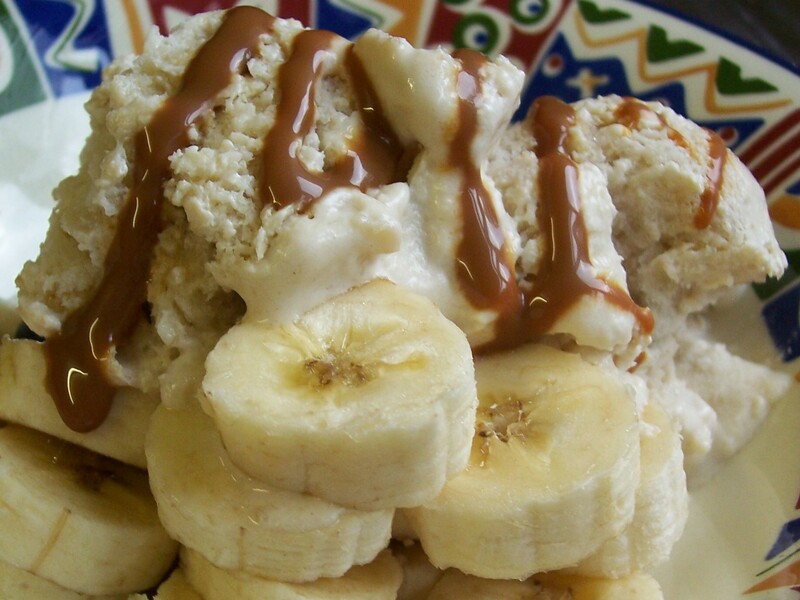 Chinese cuisine, as a rule, is not known for having an extensive dessert repertoire. I remember one of my first visits to a Chinese restaurant where there was a choice of pineapple or banana fritters, sticky stem ginger with vanilla ice cream or ‘chow chow’, a mixture of candied fruits in ginger syrup. It is a long time since I have seen any of those on the menu. Whatever happened to chow chow – can anyone shed any light? (I mean the dessert of candied fruits in ginger syrup that used to be part of the dessert menu in UK Chinese restaurants 30 or so years ago – not the mixed pickled vegetable or the Chinese dog!) It was one of my favourites but it has completely disappeared with just one reference to it on the web, also by a puzzled enquirer. These days mostly there is a selection of ice creams and sorbets that have been bought in ready made: my favourites are the hollowed half coconut shell filled with coconut ice cream or the similar pineapple version. 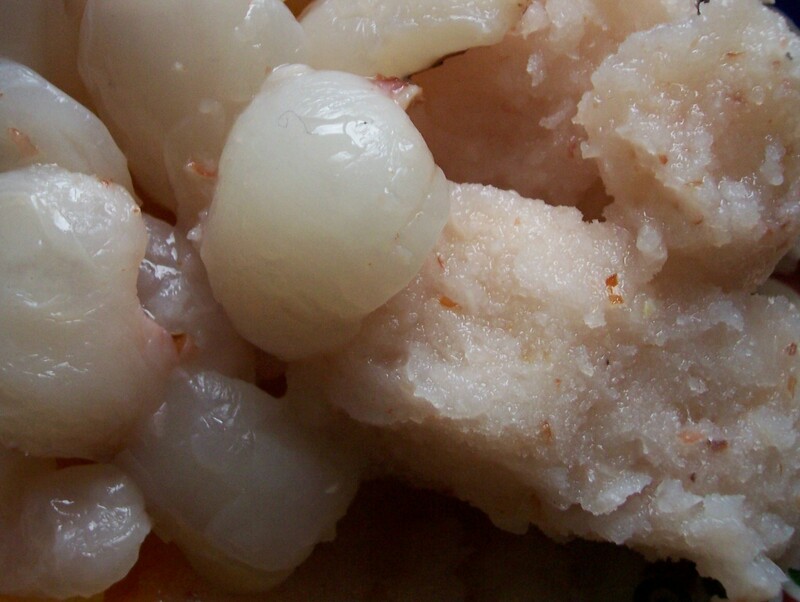 One other dessert I remember from days gone by is a simple bowl of lychees, probably ready stoned and tinned in syrup. Light and fragrant, lychees are a perfect fruit to end a chinese meal so when I came across this recipe it seemed to fit the bill very well. 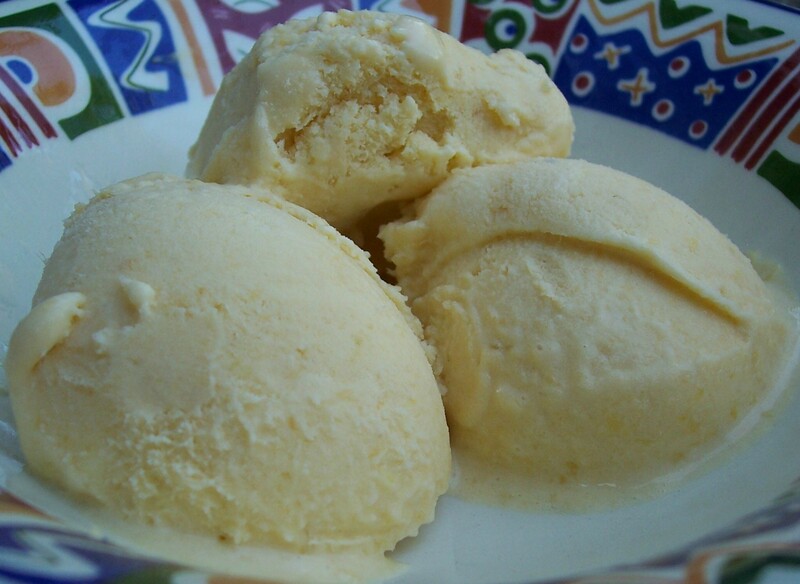 This sorbet would also be refreshing served after a spicy curry. 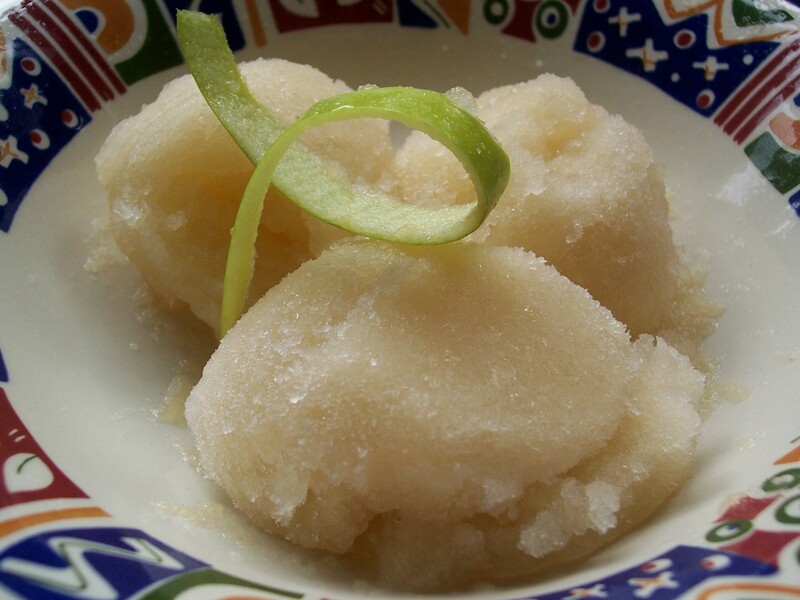 The original recipe for lychee sorbet came from food writer Nigel Slater, published in the food and drink pages of the Guardian Newspaper online. 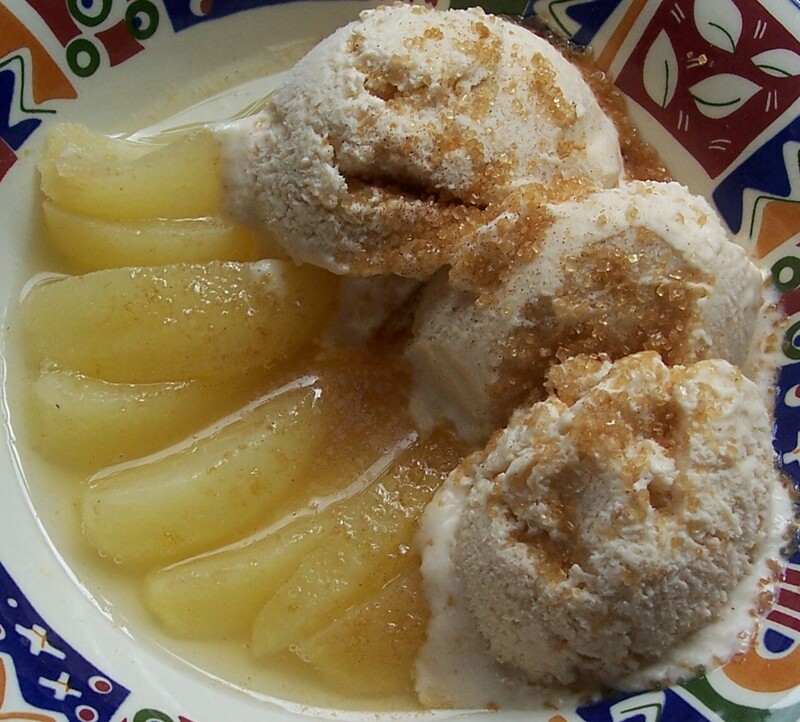 I used fresh lychees from our market, which are readily available in the Autumn and around Christmas. Tinned lychees are available as well and Nigel Slater suggests substituting a 400g tin, using both fruit syrup. The result will be good but the flavour less delicate than if you use fresh lychees. On the plus side, you will avoid having to peel the fruit, but it is not much of a hardship. This is a delicious and simple recipe with the lime juice a necessary addition as it cuts through the extreme sweetness of the lychees. Be sure to liquidise the lychees thoroughly. 1. Peel the lychees and count them. Without removing the stones put them in a pan with the sugar and water. 2. Add the sugar and water. Bring to the boil. Once the liquid is boiling and the sugar has all dissolved, turn off the heat and leave to cool. 3. When it is cool enough remove the stones from of the fruit and discard them. Reserve the syrup. 4. Return the lychee flesh to the syrup and add the lime juice. Chill thoroughly in the refrigerator. 5. Liquidise in a blender or food processor until smooth. 7. Peel and stone some of the reserved lychees. Serve alongside scoops of the soft-frozen sorbet. The simplest recipes are often the best – I think I may have written this line before … This dessert is a quickly made citrus flavoured cream, to which fruit pulp can be added, which is then served with or without additional fruit. It would certainly be worth substituting lemon or orange (possibly tangerine too) for the lime and then partner the mousse with other fruits. I intend to experiment with this idea and add variations on this page as they arise. I have already combined lemon and strawberry in another recipe and know that to be a delicious combination. This first recipe is a variation on the original, Mango Lime Mousse by chef Nick Nairn found on the BBC Food website. The earthiness of the mango certainly complements the lime beautifully. Although called Mango Lime Mousse, it was actually a lime mousse served with mango. When I made it my mango was very soft and I ended up with pulp rather than recognisable pieces. I decided to combine the fruit with the lime mousse and then to cut up another mango, which was firmer, to serve alongside. The original recipe called for half a mango: I ended up using two, so the whole mango and lime balance of this recipe has been altered from the original. This recipe uses half a tub of cream and generously served three people. For four people it would be necessary to use the whole tub of cream and the proportions of the other ingredients either increased or kept the same, depending on personal preference. For six people I would add another mango, half as purée and half as cubes or slices. I see no reason why a fruit and cream mixture could not be churned in an ice cream machine (or for those without a machine, semi frozen and then well stirred once or twice to break up the crystals before the final freeze). 1. Whisk the cream and sugar together in a bowl until thickened. 2. Zest and squeeze the lime. Fold into the cream mixture until well combined. 3. 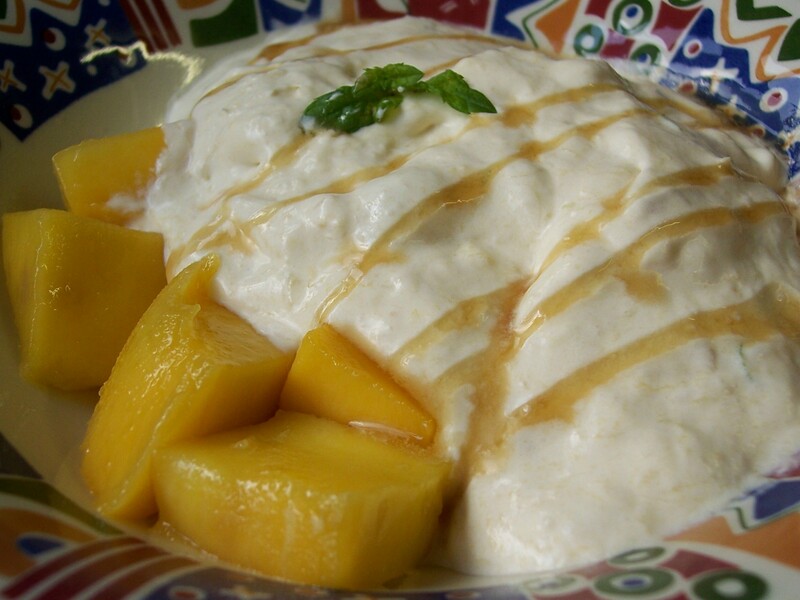 Pulp or purée the softest mango (this is a good way to use an over ripe fruit) and whisk into the lime cream. Place cream mixture in the refrigerator until it is to be served. 4. Arrange some cubes or slices of mango in each serving plate or dish. 5. Spoon the lime mixture on top, drizzle with honey and decorate with a sprig of mint.